For the first time since its construction in 1963, Flansburgh House in Lincoln, Massachusetts, is for sale. Constructed by Earl R. Flansburgh (1931-2009) for his own family, Flansburgh House was built to illustrate Mr. Flansburgh’s approach to Modern residential design and was featured in a number of contemporary publications including Architectural Record (September 9, 1965) and Better Homes and Gardens (November 1966). Flansburgh House is set on a slightly sloping wooded lot, surrounded by tall, White Pine trees and stone walls built by Mr. Flansburgh and his sons. The house comprises 2,382 square feet designed in a square around a central courtyard, with nine rooms, a large entry hall, and two bathrooms placed along the outside walls. Glass windows and sliding glass doors line the outside walls punctuated by narrow, vertical plywood box-like projections, referred to as “ventilating fins” by Mr. Flansburgh, which contain outward swinging doors painted bright yellow with screens that can be opened to provide ventilation. 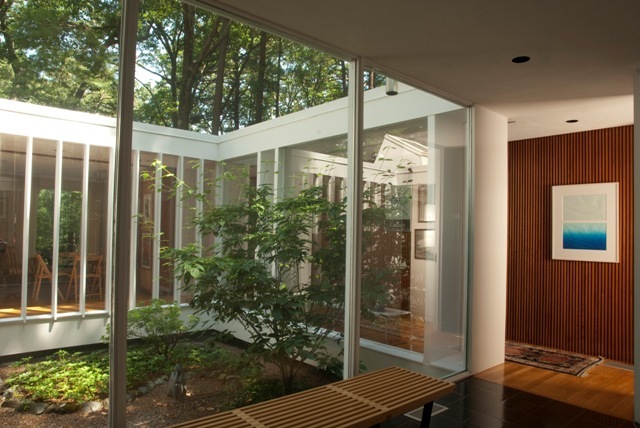 Glass walls with open hallways line each side of the open courtyard, allowing natural light to penetrate from both the exterior and interior of the house. The garage, located to the north of the house and built partially into the ground, was constructed in 1967, along with a tunnel connecting the garage to the cellar of the house. Flansburgh House retains its original character and is an important, intact example of mid-twentieth century American Modern architecture. In 2010 the Flansburgh family donated preservation restrictions to Historic New England’s Stewardship Easement Program with the goal of protecting the architecturally and historically important features of the house and landscape, while allowing the premises to be updated to meet the needs of modern living. To accomplish this goal, Historic New England will work closely with all future owners to ensure that all future alterations are done in a sensitive and reversible manner that will impact the significant features of the property as little as possible. The preservation restrictions identify those features that must be preserved as well as those parts of the property that can be adapted to the requirements of modern living. Future owners of the house have the flexibility of renovating the bathrooms and kitchen, adding central air conditioning, finishing the basement into living space, and may furnish the house with furniture, artwork, and carpeting of their choice. Additions to the house, including porches, are possible with the prior review and approval of Historic New England. For more information please contact listing broker Bill Janovitz at 781-856-0992 or at LexingtonJanovitz.com.